Tomorrow (Sept. 15) sees the final demise of the Cassini spacecraft, as it plunges into the atmosphere of Saturn, after 17 years of continuous discovery. The Royal Astronomical Society (RAS), the leading UK body for astronomy, space science and geophysics, counts among its members many of those involved in the mission, and offers its congratulations to the teams at NASA, ESA, ASI, and around the world, whose efforts saw the spacecraft deliver science from its launch to its destruction. Professor John Zarnecki, the President of the Royal Astronomical Society, led one of the 6 instrument teams on Huygens, as it made its successful landing on Saturn's largest moon Titan in 2005 – the first time a spacecraft had touched down on a world in the outer Solar System. For this achievement he received the Society's Gold Medal in 2014, as did RAS Fellow Professor Michele Dougherty, who led the Cassini Magnetometer team following on from Professor David Southwood (also a former president of the RAS, from 2012 to 2014). Cassini-Huygens travelled to Saturn via a circuitous route, using the gravity assist technique to receive boosts in speed from the Earth, Venus, and Jupiter, and taking in an asteroid, Masursky, along the way. The spacecraft sent back remarkable images and copious data from each object, finally reaching the Saturn system in 2004. On arrival it toured the Saturnian moons, making multiple passes of many of them, and building up more detailed maps than ever before. 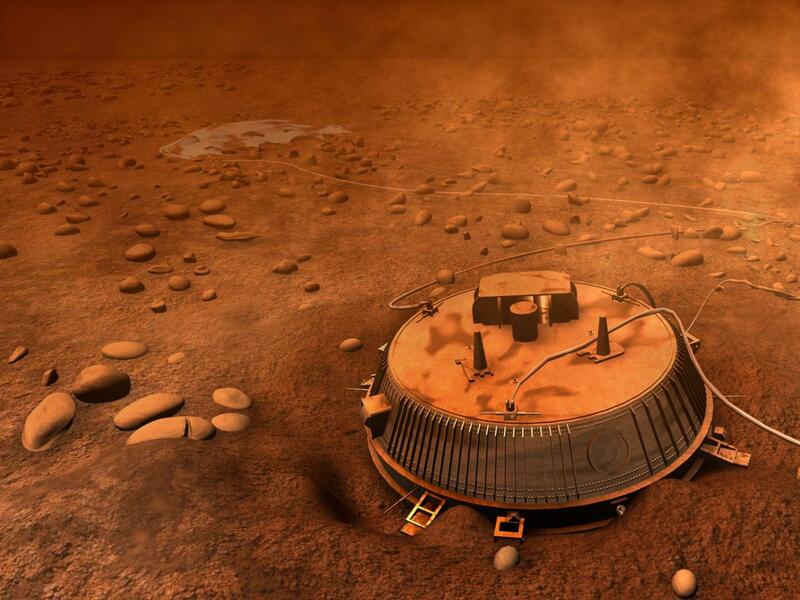 The Huygens lander descended through Titan's atmosphere for 2 hours and 27 minutes, making a soft landing at 10:13 GMT on 14 January 2005. Via Cassini, the probe sent back data, including the first images of the moon's surface, for 72 minutes after touchdown, and radio telescopes on Earth detected transmissions for some hours later. Huygens and Cassini found Titan to have 'rivers' and 'seas' of liquid hydrocarbons, in a landscape remarkably Earth-like in appearance. When Huygens arrived, its landing site was at a frigid -180 degrees Celsius, but the moon's atmosphere and surface still have complex chemistry. Including Titan, Cassini explored a total of 19 Saturnian moons in detail. Another of the highlights was the 2005 discovery of jets of water ice from the moon Enceladus, with evidence for a subsurface ocean found in 2014. In recent months, following several mission extensions and by now running out of fuel, Cassini has been directed to end its life in a deliberate collision with Saturn, to avoid contamination of its moons. En route, it has made multiple close approaches to the planet itself, travelling within the innermost of its rings, and sending back detailed images of the atmosphere. Looking back, Professor Zarnecki said: "It's been an amazing 17 years. When Cassini-Huygens launched we held our collective breath, until it was safely on its way. I started work on this project around 1990, and with such a distant goal I knew it would be a while before the science results came back. We couldn't have expected better, and it's been a privilege to be involved with this extraordinary mission." The final descent and atmospheric entry of the Cassini spacecraft will occur on the morning of Friday 15 September UK time, with the spacecraft finally burning up in Saturn's atmosphere at around 11.32 BST, bringing to an end one of the most successful space missions in human history.